Here is a simple Amibroker AFL trick which will replace your default profit table in your Amibroker Backtest report with Colourful profit table along with CAR%, yearly Max Drawdown (maxDD%) as well as overall maxDD% as shown below. And its better version of profit table as it provide more meaningful insights. 3)Remember to backup the default “3. Profit Table.afl” first, i.e. by renaming it to “3. Profit Table.bak”. 4)Now Run a backtest and goto Reports to see the new colorful Profit Table. 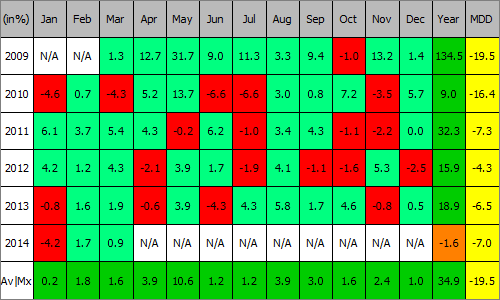 I just stumbled upon your revised Profit Table with MDD. While I love the idea, the performance numbers don’t match the built-in profit table. Is there a reason that I’m missing?